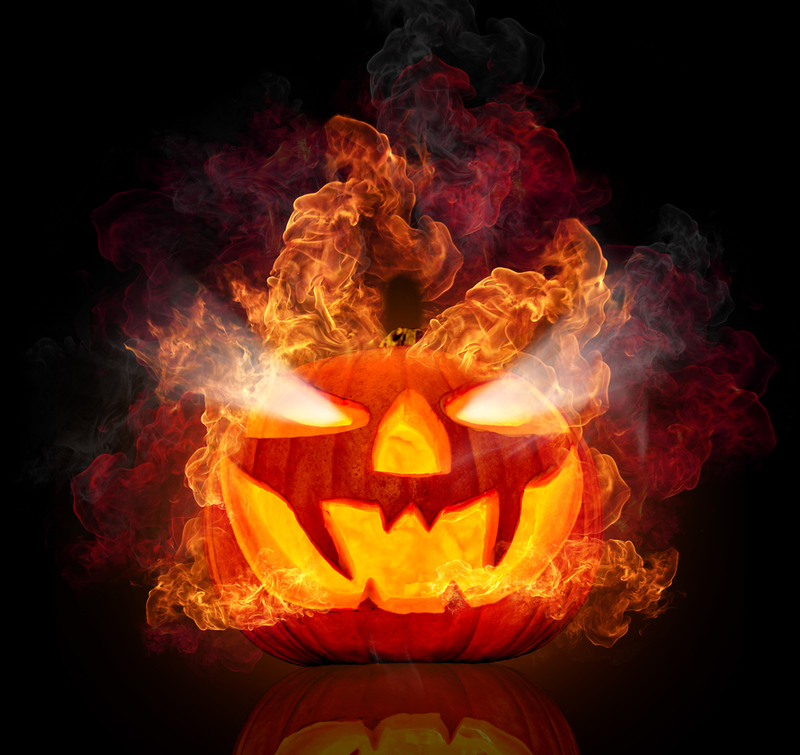 Are you looking for a unique one of a kind pumpkin to set on your porch this Halloween? This pumpkin fits the bill with it’s Halloween graveyard landscape that’s distinct from any other pumpkin that you’ll see set out on other porches this year. 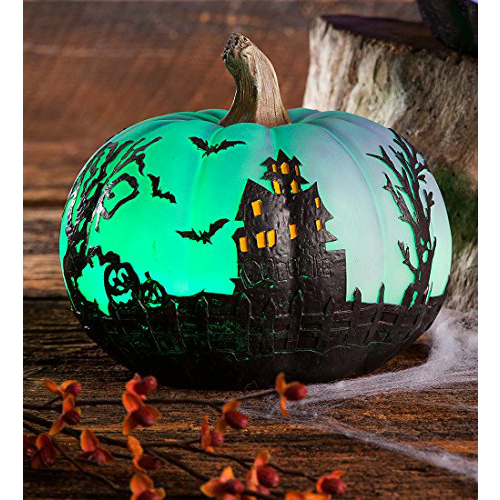 It also comes in two varieties, tall and short, this pumpkin decoration is made from weather-safe resin with a decorative accent that works as an outdoor and indoor decoration. As if that wasn’t enough, it also changes colors thanks to a battery-operated interior light! With such a muted design that it will not scare the younger Halloween trick-or-treaters and will definitely entertain them while asking for treats at your door this Halloween! 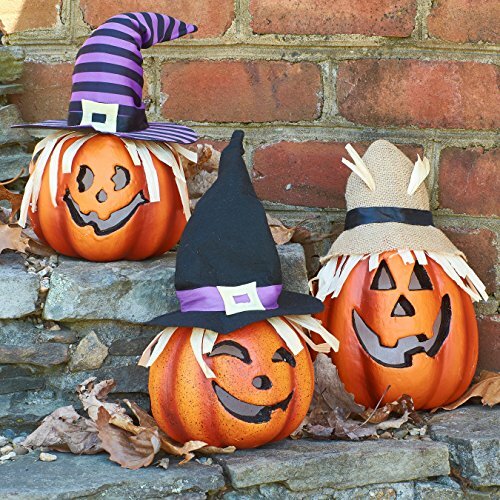 This cute trio of Jack-o Lantern Pumpkins is just right for your home! They each have their own individual look which gives them all their own personalities! 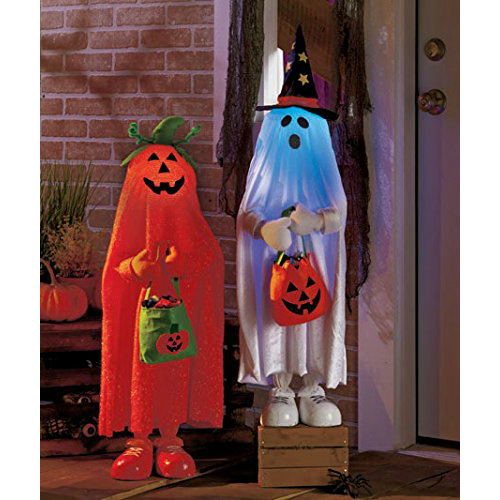 Each pumpkin is made from a foam material which makes them lightweight and easy to set up! On top of that, they also have internal lights that can be switched on and off at will. Perfect for a window display! Oooooo! Watch out for these spooky pumpkin-ey ghosts! These special little ghosts are just the cutest thing! They are almost 3 feet tall too, so they look like little kids just chilling outside your door or from the comfort of inside your home! Just remember, it’s best to use them in a covered area as they are lightweight, therefor being susceptible to wind and heavy weather. They come together as a pair and work perfect standing next to each other!